in Football at 7:19pm with 1 comment. The last few months have been clearly the most eventful in a particularly eventful lifetime of following Darlington Football Club. 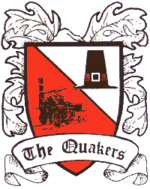 The club has gone through numerous changes in the time have been a follower of Darlo since the late 80s. I have witnessed the full rollercoaster from relegation from the Football League, to consecutive promotions, further relegation, playoff heartache, two administrations, another relegation from the Football League, winning the FA trophy and yet another administration. It's safe to say I thought I'd seen it all, but this season brings with it even bigger changes. This coming season a team that the FA calls Darlington 1883, but is simply known as Darlington Football Club to me and my fellow Darlo fans will begin a promotion chasing campaign in the Northern League at Bishop Auckland FC's Heritage Park. So that's a drop of four divisions, in a ground with 24,750 less seats, and two less sides. Players with full time jobs outside of the club but perhaps most importantly, owned by the fans! The FA rightly or wrongly have harshly punished DFC with their enforcement of their view that DFC is now a new club, a view with is strongly refuted by the fans and interim board. The punishment was dished out because an agreement couldn't be made between DFC 1883 - the new company and the former chairman. It was also not helped by the face that Mr Singh would sign across the 'Football Share' to the new company without attaching unacceptable conditions. Throughout all this the FA had managed to build up expectation by reacting positively to meetings with DFC 1883 before shocking the board and fans with their decisions. As previously said, the important thing is that the club is now owned by the fans through a CIC (Community Interest Company) and will never again be at the mercy of a millionaire business man who is only there for the money. This makes me, and I hope all other Darlo fans happy. There is a great outlook for our future and it is entirely in our own hands. Don't get me wrong, it's not the perfect situation, none of us would have chosen to be playing outside of Darlington and in the league we find ourselves, therefore the hard work starts right now. There is a huge need to club together to achieve our goals both on and off the pitch, to get back into Darlington and into the Football League. It's a long process of fundraising and volunteering that we have ahead of us, but with over 400 season tickets sold on the first day of sales and a rich calendar of fundraising events already organised (beginning with a Charity match on this coming Saturday featuring yours truly) the club looks to be on the right track already. in Football at 8:28pm with 0 comments. Today was effectually the end for Darlington FC, it looked grim. Despite all the efforts made by the fans there was no sign of a way out. But as has become the style with the club in it's times of crisis last ditched attempts to sort this mess have appeared to be successful! DFC 1883 - the fan's company - has acquired the assets of Darlington FC 2009, those assets include the club itself, along with it's name, badge and history. This means that Darlington FC will carry on, not a new club in technical terms, but a new club in ownership, spirit and optimism. So what is next? Now the new board of 1883 will apply to the FA for a 'Football Share' - a licence to play football, at this time the FA should make a decision on where in the football pyramid we will be placed. Though that is expected to be around the Evostik Premier, meaning games with the likes of Whitby! Darlington will also leave the Darlington Arena, and initially look to share a ground with a club in a nearby town, be that Bishop Auckland, Shildon or possibly Durham. 1883 have promised that a move back to Darlington will be a priority, and are exploring the possibility of a 'Sports Hub' on Blackwell Meadows - the site of the current Darlington Rugby Club facility. It's come at a big cost to get free of the mess that previous chairmen have got us into, but optimism is back at the club, and the future is now in the hands of the fans, not the whim of one millionaire who may inevitably get bored as the previous few have. This is the situation as I understand it, and I for one am now looking forward to our tour of the lower leagues in the pyramid. Roll on next season!